22-year old forward Landry Ndikumana (198-F-95) had an amazing evening in the last round for City Oilers and receives a Interperformances Player of the Week award for round 6. 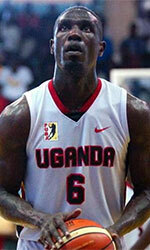 He had a double-double of 16 points and 13 rebounds, while his team outclassed UPDF (#12, 1-9) with 26-point margin 79-53. City Oilers is placed at 3rd position in Ugandan league. They would have been even better if they hadn't lost a few games earlier this season. City Oilers will need more victories to improve their 6-3 record. In the team's last game Ndikumana had a remarkable 58.3% from 2-point range. He has many years of experience at City Oilers, through which he has constantly improved. Ndikumana has impressive league stats. 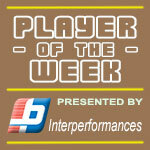 He is in league's top in points (9th best: 12.8ppg) and averages solid 59.4% FGP. Second best performed player last round was Charles Semugabo of Sharing Youth. In the last game recorded impressive double-double of 18 points and 11 rebounds. Of course he led Sharing Youth to another comfortable win 60-45 over the lower-ranked Charging Rhinos (#10, 3-8) being unquestionably team leader. Sharing Youth's 6th position in the standings has not changed. His team lost some distance to top teams. But 5-5 record is not bad and everything may still change. Semugabo is one of the most experienced players at Sharing Youth and has a reputation of one of team's most reliable players. He belongs to the best scorers in the league with 13.5ppg (#1). He also registered 8.3 boards per game. Third place about best performers goes to forward Amisi Saidi (F-87) of Pemba Warriors (#5). Saidi scored 18 points and grabbed ten rebounds. He was a key player of Pemba Warriors, leading his team to a 71-65 win against slightly lower-ranked Sharing Youth (#6, 5-5). 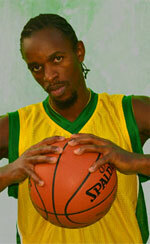 Pemba Warriors needs these victories very badly if they think about getting closer to top teams. Their record at this point is 6 victories and 4 lost games. Saidi has a great season in Uganda. After only 7 games, he made it on the list of the league's leaders in points with 14.0ppg (5th best) and rebounds with 8.0rpg (6th best).